WWI football, but not that match, the one we all know about. 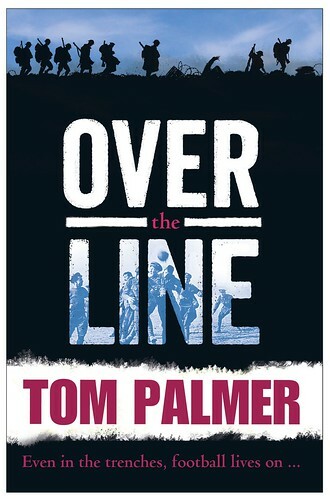 Tom Palmer writes about a young football player going to war, and he’s not the first one. A couple of books I’ve read recently begin with young men and their hopes of becoming successful – professional – players, only to find WWI getting in the way. It wasn’t the done thing to ‘avoid’ signing up because you were about to get your big break. Jack in Over the Line is a really good player, but once he’s played his first season he enlists, along with team mates as well as players from ‘the competition,’ and they are placed in the Footballers’ Battalion, who play against other soldiers when not in the trenches. This is another engaging Barrington Stoke story, and because of the soccer aspect it’s refreshingly different from other WWI books. As it’s a short book, it can only afford the briefest of description of life in the trenches. This doesn’t matter – in fact, it possibly helps – as the stark horror of war is painted in a few words. Some of the people around Jack die, but by the end of the book the reader realises that surviving the war isn’t necessarily the wonderful fate you’d think it would be. A very footbally war story, and interesting, even for non-soccer fans. Tom will launch his book with the help of the Manchester Children’s Book Festival on Sunday 6th July. Twice, in one day. Be there! It’s hard getting used to thinking of 1989 as being a retro year. But sooner or later most things turn retro, and here is an old favourite being reissued. 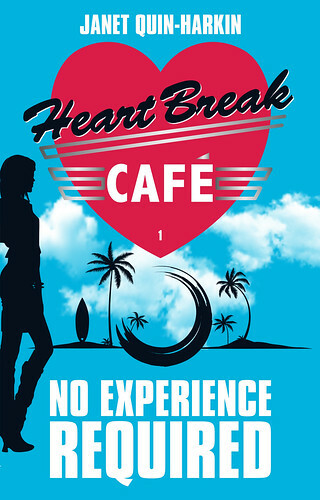 Maybe you read Janet Quin-Harkin’s Heartbreak Café series 25 years ago, and would like to visit again. I didn’t, so for me it was a pleasant return to old values in a new-to-me book. In a way this is no different from a Sarah Dessen. No mobile phones or computers, and fashion has changed a little, but other than that we have the same American teenagers driving around in their nice cars, going to school and planning for college, working part time, and falling in love. Dealing with parents and some kind of problem, but mostly hanging out with their friends in that very American way people in the rest of the world are so fascinated by. Debbie is 16 and has to find a job when her parents divorce and money suddenly becomes an issue. Instead of going for the safe kind of job you could seemingly expect back then, she finds a job waitressing and cooking burgers at a beach café. The young and handsome boy who runs it reckons she won’t last, so obviously Debbie has to prove him wrong. The hardship we are all mostly used to today is missing. Or maybe it is still an American idea that if you work hard you will have to succeed. I’d like to think this book will appeal to teenagers today. Whether it will seem hopelessly dated, or just charmingly retro is not for me to say. I was old even in 1989. But this is fun and a bit romantic and so very American. And to Janet’s credit, she didn’t end the book the way I’d been expecting. When Kevin Brooks won the Carnegie Medal this week, war broke out over how dark you can have your children’s books. Kevin’s The Bunker Diary is apparently very dark indeed (and I think that’s why I chose not to read it), and some people love it and others don’t, at all. I seem to be in agreement with Amanda Craig in The Independent, who prefers her Carnegie winners to be for younger readers, and she wants the books to have hope. Not necessarily a happy ending, but there needs to be some reward for all that gloom. But then there are many who actively like dismal realism, and say that children can take it. I agree with the last statement. Children don’t need protecting from gritty and realistic literature. Whatever they encounter in their own lives, they will welcome in fiction. You want to read about people like yourself. But I suspect that a little bit of something positive would be welcome. Not an unrealistic sugary ending, but something. Something you could add to your own life, even when you have no power. But we are all different, which is why Kevin was awarded the Carnegie Medal, and why so many feel it was the right thing. I’m happy for him (although if this was fiction, I suppose for Kevin never to win would be suitably dark realism) and I’m convinced it’s an excellent book. Just not a happy one. I’m a little surprised at Amanda’s outspokenness, but as one of our leading critics she can get away with it. The press have been more than keen this week for articles on the subject. I believe there is more coming. It’s good that children’s literature can stir up feelings. We arrived in the run-up to the Battle of Bannockburn 700th celebrations, which kick off big time today. The Resident IT Consultant has understandably been more excited than me. He is the historian of us, and the native. But I thought I’d be reasonably OK with going along to the new visitors’ centre to experience the battle. Maybe I’d have been less underwhelmed if I’d studied the website in detail before going. I didn’t look at it at all, because in general I’d expect anywhere like that to be possible to negotiate without an instruction manual. It was complicated, as well as dark and confusing and it involved standing up at all times, which pales rather when you’ve signed up for nearly two hours of battle. (I know. It was worse back in 1314. I shouldn’t moan.) I don’t take in unexpected oral instructions very quickly, and I feel if a venue has to send you off into battle with a written booklet (there wasn’t one) they have missed out in the design of the whole place. I suspect what it is, is a lack of theory of mind on their behalf. They know how it works, because they built it and/or work there. I’d be a lot better on a second visit, but at £11 a pop it’s not something people will do (unless a member of the Scottish – or English – National Trust), or can’t do if they are visiting from elsewhere. You start off with 3D glasses which put you straight into the path of battle. We discovered we were in direct line between the arrows being fired and their goal. We had soldiers impaled by horrible weapons right next to us, and horses riding by an inch away. That was very instructive. Next you can meet and chat to a dozen or so people involved in the battle, from both sides. Technically it veered between very easy to impossible to get your hand-waves hit the right spot. But like the first bit, it was quite interesting and helps you understand war of any kind. Then came the ‘shows’ we had time booked tickets for. I’d assumed sitting down. I’d assumed slightly bigger venue. Finding it was tiny and standing up, and nowhere near interesting enough (to me) to remove the claustrophobia from being foremost on my mind, I spent five minutes picking up the courage to leave the room. As I’d suspected, the doors were not easy to open, and required the help of the person running the battle show, which rather removed any hoped for inconspicuousness on my part. Once out, I didn’t mind ‘losing out’ or having to wait for my historian to stand through the whole thing. Although, the only choices for sitting down (I had over an hour to wait) was the wall by the car park or in the café. I tried both. Outside was cold, and inside I found out exactly how uncomfortable those trendy Tolix chairs can be. When I had also witnessed other visitors being unable to identify the correct door to the toilets and overheard a member of staff saying they were badly signposted, I could only conclude someone has forgotten that first-time – and possibly once-only – visitors need clarity, and in more ways than one. It’s like starting a new school. You know nothing to begin with, but learn by returning every day. You won’t be going to Bannockburn quite as frequently as that. But, all in all, a lovely concept. I liked finding out what it might have been like standing in that field 700 years ago. I would have appreciated more information beforehand, but then so would the soldiers back in 1314, I imagine. If you are not phobic, do go. But watch out for the arrows! Wouldn’t it be nice to be an expert at lots of things? Except you can’t. There is a limit to how much you can delve into different areas of interest. And that’s when it’s good to have someone who does it for you. Barry Forshaw knows a lot about crime (in the right sort of way). He is a Nordic crime specialist, but reads a wider diet than that. Here he is with his new Euro Noir, briefly outlining crime fiction and films in a number of European countries. I’m ashamed to admit I’d never considered whether there are Polish crime novels. He wondered what I would make of the Nordic section, which is only right, since I know almost nothing about Romania or Greece when it comes to crime, or any fiction, now that I think of it. But if I did want to read something so drastically new, I now know where I would begin. With this book. And then one of the ones mentioned in here. Barry is right to ponder how he can cover Nordic crime yet again and so briefly, but he has succeeded. There is a good selection of authors from a long time ago as well as now. And he does the same for the other Nordic countries. You might know a lot of it already, but I bet there will be something new for everyone. And once you’ve covered the north, there is all the rest of Europe. If I were to tackle French crime I’d have to go to Fred Vargas. Barry very sensibly asked various specialists to write a page on what they like best, and my colleague Karen Meek likes Fred Vargas. That’s good enough for me. There is a wide coverage of films, including some pretty ancient ones, and obviously the recent euro crime we’ve seen on television during the last few years. Again, you might know it all, but that doesn’t prevent this from being interesting to read. 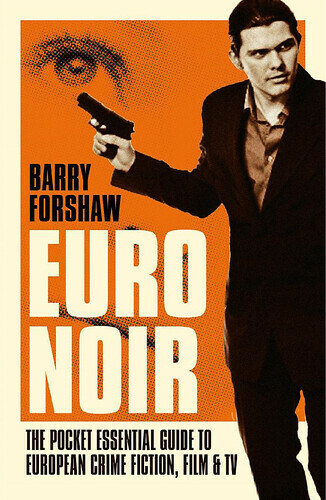 Euro Noir is a short book, which will quickly tell you what you need to know. I would like to think that this new Swedish thriller, will be the next huge success story from the country that gave the world the Millennium trilogy. 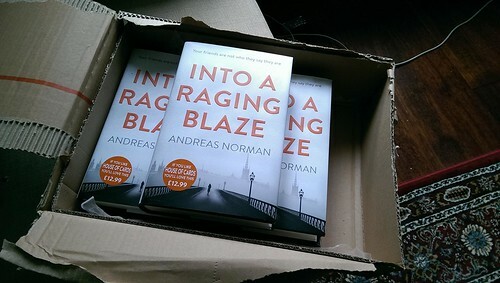 Written by Swedish diplomat Andreas Norman, who has so far only produced a volume of poetry, Into A Raging Blaze is a terrific read. En Rasande Eld, as it is in the original, is more thriller than detective story. Like The Girl With the Dragon Tattoo, it begins with seemingly unconnected things, and the seemingly humdrum routines ‘at home’ at the Foreign Office in Stockholm. You wouldn’t think that finding out about department meetings or how to request a new office chair would be interesting. But it makes for compelling reading from the first page, and by the time you’ve grown quite fond of FO employee Carina Dymek, her career is in tatters and you swiftly move on to Secret Security Agent Bente Jensen, based in Brussels. Bente is probably very slightly on the autistic spectrum. She is no Lisbeth Salander, though. Very likeable and very competent, it is she and her secret team who have to work out what’s happened. Did Carina really handle top secret, potentially terrorist, material on purpose, or was she set up? Is her Arab boyfriend Jamal cultivating her to aid him in some sinister plot? Or are they – as they seem to be – simply two nice young people, accidentally caught up in something much bigger? MI6 are the bad guys here. You need to get used to that. Very efficient, and quite scathing about the naïve Swedes, they really set the ball rolling. And once they have, it’s well nigh impossible to stop it. So here you find various secret services having to work together, but in effect working against each other. It is very much a page turner, and you become quite paranoid after a while. I read with my heart in my mouth. How can anyone ever be safe from the intrusion of agents the world over? Have you any idea of how it feels to be the prey in such a powerful hunt? Into A Raging Blaze is the first of two books featuring Bente Jensen. It was published in Sweden last year, with the second one due in 2016. English language readers have something great to look forward to. One of the best authors from my childhood – Gunnel Linde – has died. I first got an inkling of this on Sunday morning when a facebook friend mentioned losing her ‘cucumber mum’ and realised something was up. Later the same day another facebook friend linked to Dagens Nyheter where I could read some more. But no matter how I googled, there was simply no more news. In this day and age that seems strange. News comes to you immediately. And here I was struggling to confirm it or to find out more. Another strange thing for me is that I knew so very little about her. Now I keep track of writers and know much about them, apart from their work. As a child I only knew what I needed, which was that I liked her books and to find one with Gunnel Linde’s namn on the cover was a recommendation. No need to know what they look like or if they have a dog or where they get their inspiration. You just read the books, usually borrowed from a library. Now, thanks to Maria Nikolajeva, I know a little more about this woman who was like a mother to her. It makes for very interesting reading, and what it also did for me was to want to know more about Maria (who is one of the few people whose name I have mentioned to the Retired Children’s Librarian and managed to impress her with). Perhaps I shall ask. I first mentioned Gunnel Linde here last year, having been reminded of some of my childhood reading, and finding I shared my liking for her books with author Mårten Sandén. Since I didn’t know all that much before, I’m glad I’ve found out a bit more.